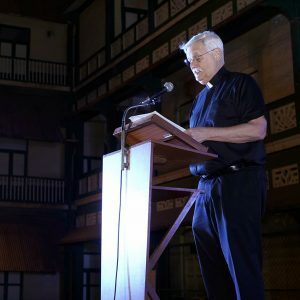 A month ago, Father Arturo Sosa, Superior General of the Society of Jesus, spoke to Jesuit school and college elders in Bandra, a predominantly Catholic suburb of the Bombay metropolitan area. As part of an Indian tour, the Superior General of the Jesuits stood up in front of an audience made of alumni from the Company’s establishments based in Mahārāshtra and reminded them of the fundamental values he has defended since his election in September 2016: partnership, leadership and reconciliation, as well as action in the face of urgency. Following the publication of the Universal Apostolic Preferences, which are supposed to guide the Society and its missions for the next ten years, and its participation in the Meeting on the Protection of Minors, which was held in Rome from February 21 to 24, it was more than obvious for Father Arturo Sosa to emphasize these values and to awaken in these elders their common experience of Ignatian spirituality and their ability to discern its fruits. Sosa points to a lack of leadership at the heart of our society: “We are witnessing a leadership crisis in the public sphere today. Political leaders have filled us with empty promises and we often remain complaining about a lack of good governance. (…) It is our fault and it is not by complaining that we will change anything towards a better purpose. By taking the meeting he had before him as a witness, he invites those who have benefited from Ignatian pedagogy to turn this crisis into a personal struggle and to move from consternation to action: “we need honest men and women who are able to put aside their individual advancements to serve others”. Indeed, “men and women for others” are “good people” with whom the Company not only CAN, but MUST cooperate if it wishes to continue its mission well.